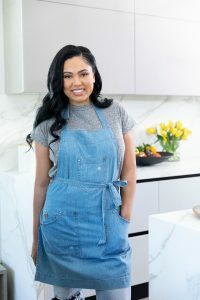 Oakland, Calif. – Feb. 1, 2019: Celebrity cook Ayesha Curry chose Jack London Square at the Oakland waterfront as the location for her first-ever pop-up store. Ayesha Curry is a cookbook author, television personality and married to basketball star Stephen Curry. Her shop opens to the public tomorrow from 11 a.m. to 7 p.m. “Homemade” will be open during February, Wednesday through Friday from 4 p.m. to 7 p.m. and on weekends from 11 a.m. to 7 p.m. The new shop is nestled between Oakland Supply Co. and California Canoe and Kayak at 423 Water Street and is located across from Plank. The retail store will feature an array of Ayesha Curry’s signature home products including bedding, cookware, gardening kits and more. She is hosting a book signing at the shop Sunday, February 10, at 11 a.m. in collaboration with CUESA’s Farmers Market at the Square.